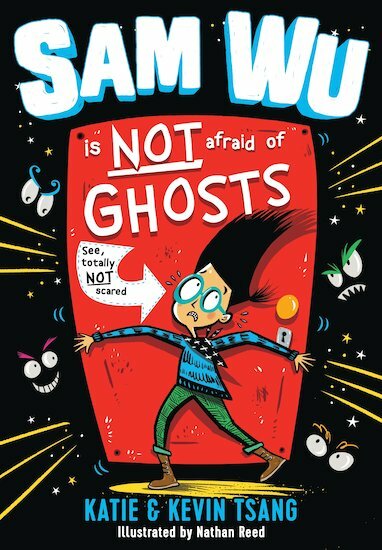 Buy Sam Wu is NOT Afraid of Ghosts! Use Rewards for Sam Wu is NOT Afraid of Ghosts! Scared? Pah! Sam Wu isn’t afraid of anything. Well, except ghosts, bullies and being lost in space. But now the school bully, Ralph Philip Zinkerman, is calling Sam a scaredy-cat after THE EVENT THAT MUST NEVER BE SPOKEN OF AGAIN (so don’t ask!). Sam needs a plan of action to prove how brave he is and get this nasty bully off his back. First he needs a suitably scary sidekick: a deadly and terrifying pet. Then it’s up to him to defeat the Ghost King once and for all. But when a trip to the Space Museum goes very wrong, will Sam end up facing ghosts in space? Aaargh!!! !